“Ash”, taken from Migration: New and Selected Poems, by W.S. Merwin, and used here with permission from the author. This entry was posted in Daily PAW Post contributor and tagged Daily PAW Post, Poets Against the War, W.S. 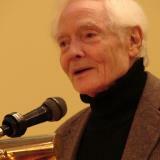 Merwin. Bookmark the permalink.